This sample is still in its original package addressed to Jno. Soane Esqr. / Lincoln's Inn Sqr. 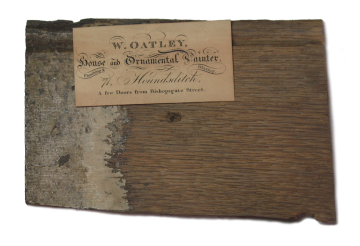 sealed with red sealing wax, inscribed in Soane's hand 1829 / Specimen of / Paint to Imitate / Wood. 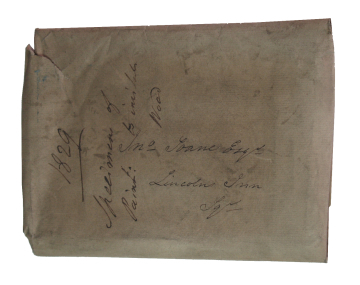 The wrappings contain the trade card of Mr. W. Oatley, House and ornamental Painter, 71 Houndsditch, and an undated letter drawing his work to Soane's attention & giving prices. 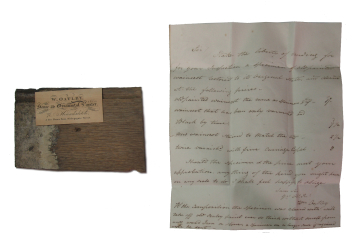 Enclosed is also this sample to show how old painted wainscot can be cleaned & restored to its original appearance. A post-script adds The composition used will take off old thick scaley paint without smell from any wood, iron or stone. This graining sample does not appear in the inventories of Soane's collection drawn up in 1837 because it was in one of three 'sealed receptacles' created by Soane with instructions that they should not be opened until later in the 19th century.